Find city information about Rehoboth, MA including homes for sale in Rehoboth. Find city information about Attleboro, MA including homes for sale in Attleboro. Find city information about Norton, MA including homes for sale in Norton. Find city information about North Attleboro, Massachusetts including homes for sale in North Attleboro. Find city information about Seekonk, MA including homes for sale in Seekonk. Cedar Hill Realty has expanded its offerings to include custom log and timber frame residential and commercial structures through its new company, Cedar Hill Log Homes. As an Independent Dealer for Honest Abe Log Homes, a leader in the log home design and manufacturing industry since 1979, we're bringing Honest Abe's custom designed, energy efficient products to the region. We work with you throughout the design, financing and construction process. 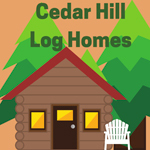 Let Cedar Hill Realty and Log Homes find you the perfect property and make your dream of having a log or timber home a reality. Cedar Hill Realty is your number one source for Rehoboth, MA Real Estate, Attleboro, MA Real Estate, Norton, MA Real Estate, North-Attleboro Real Estate, Seekonk, MA Real Estate, Plainville, MA Real Estate and surrounding towns. Ask about Cedar Hill Log/Timber Frame Homes!